After three straight losses knocked them out of first place, the Seattle Mariners rebounded to beat Oakland and reclaim the AL West lead. Seattle took an early lead, then hung on as relievers Arthur Rhodes and Kazuhiro Sasaki pitched 3 2-3 hitless innings and beat the Athletics 3-2 Sunday in the finale of the big four-game series. "If we would have gotten swept, we would have been down a game and then we'd have to rely on somebody else," John Olerud said. "Today was a game we had to win." The Mariners (87-69), who had won eight straight before losing three in a row to Oakland, take a one-game AL West lead into the final week of the regular season. "We're trying to a win a division here," manager Lou Piniella said. "We're not trying to be the wild card." The A's (85-69), who on Saturday reclaimed the division lead for the first time since June 28, are still atop the wild card standings, one game ahead of Cleveland (84-70). Oakland goes home for four games against Anaheim and three against Texas, then may have to play a makeup at Tampa Bay on Oct. 2. "I'm not disappointed with this series by any means," said Oakland manager Art Howe, who hoped to win three out of four at Safeco Field. "We're right where we want to be." After an off-day Monday, Seattle has three games at home against the Rangers, then finishes with three games at Anaheim. "We've got two more wins than they (the A's) have," Piniella said. "That's certainly in our favor." "Our hitting stunk in this series, starting with me," said Seattle's Alex Rodriguez, who was 0-for-4 Sunday and 1-for-16 in the series. "But we won today and every game we win now is important." John Halama (13-9) allowed two runs and eight hits in 5 1-3 innings, improving to 9-4 at home. Rhodes, who got the decision in Saturday's 8-2 loss, struck out four in two innings, retiring six straight batters. "To tell you the truth, yesterday was tough," said Rhodes, who allowed four runs and three hits and a walk in 1 2-3 innings Saturday. "I couldn't be down on myself. I had to prove to myself that I could bounce back. Today was a fun day." Sasaki got five outs for his 35th save in 38 chances, allowing only a two-out walk to Ben Grieve in the eighth and hitting Ramon Hernandez with a pitch with two outs in the ninth. Terrence Long then grounded into a game-ending forceout. "Sure, there was a lot of pressure today," Sasaki said through a translator. "We couldn't lose. The victory was good. I got a lot of joy because the win was big. The pressure will continue and there will be more joy to come." A's starter Ariel Prieto (1-2) gave up all three runs, six hits and four walks in five innings. Seattle built a 3-0 lead on run-scoring singles by Olerud in the first and Mike Cameron in the second, followed by Carlos Guillen's leadoff homer in the fourth. Jason Giambi hit a two-run homer in the sixth, his 39th of the season, following Randy Velarde's leadoff single. It was Giambi's fifth home run against Seattle this season. "Halama is a good breaking ball pitcher," Giambi said. "You have to really be patient to get a good pitch to hit." After Halama gave up a one-out single to Ben Grieve and a double to Adam Piatt, Rhodes came in and struck out Eric Chavez and pinch-hitter Olmedo Saenz. "He's just nasty," said Chavez, who singled off Rhodes to drive in the first run in Oakland's six-run seventh inning Satuday. "Yesterday, he had good stuff, but I didn't think he would come out here and have better stuff today." Seattle has won six straight one-run games. Miguel Tejada hit cleanup for the second time his season. He hit fourth Thursday night. Halama picked off Piatt at first to end the fourth, his ninth pickoff of the season. Mariners 2B Mark McLemore turned in the defensive play of the game when he made a diving stop of Terrence Long's grounder in the fifth and threw him out. The fourth sellout of the series pushed Seattle's attendance to more than 3 million (3,037,753) for the second time. 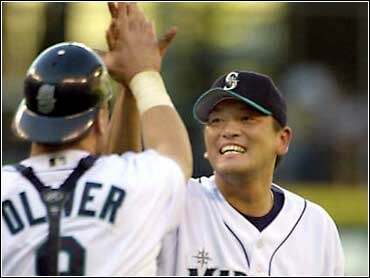 The Mariners drew 3,192,237 in 1997. Giambi's homer was the Oakland's 5,000th in 32 years since moving from Kansas City. He also hit the No. 4,000 on May 17, 1996. Sasaki's 35 saves are one why of the major league record for a rookie set by Todd Worrell for St. Louis in 1986.